The Christmas/New Year break is a time for family, reflection and lists of all sorts. So I thought I’d share with you a list of some of my travel highlights, in no particular order. Of course, the places themselves just offer a setting for the company, love and inspiration – and, hopefully, stories worth telling. No, after countless trips to the Pyrenees, I was not expecting this. How can one of the most beautiful mountain towns in the Pyrenees be so quiet, in even in high season? Lescun is a pretty mountain hamlet, but is rare in that it offers wonderful open mountain views from the town itself – not so common in the Pyrenees. Major highlights of this trip? Seeing my kids play freely around the campsite or in mountain streams. Observing a rainstorm approach and getting soaked while running away from it. Talking to the owner of one of the few restaurants in town about mountain life in low season. Prachuap, while an A-side destination for Thais, is not such a popular destination for international travelers. Still, it’s a great town for enjoying fresh seafood on the beach – especially at the military-controlled resort of Ao Manao. Prachuap also offers the extra bonus of Khao Chong Krachok, a jagged limestone peak that towers over the Prachuap beaches. I climbed it during the Songkran holidays, which allowed me to witness scores of white-skinned Bangkok señoritas sweating up their way to the summit, while aided by the friendly army officials strategically placed in the most treacherous sections of the climb. On the summit – you guessed it – a Buddhist shrine! Screw Gastein – let’s go to Hochkonig, we decided in the car. And so we enjoyed the Hochkönig ski tour from Muhlback to Maria Alm and back, taking in the beautiful views of the Höchkonig massif, and relishing every single ski run in the company of surprisingly few skiers. To top it off, my friend convinced me to drive back for a few afternoon runs at Radstadt-Altenmarkt, where we were surprised by a heavy yet windless snowstorm that only made the steady red runs all the more magical. Playa del Bolullo, in La Orotava, is a fairly well known destination for nature lovers. But it still felt secluded when I arrived with my son after a half hour walk from the outskirts of Puerto de la Cruz. The beauty of the place suggested an uncomplicated plan so we played football on the black sand and and then enjoyed refreshments at the ineluctible chiringuito. 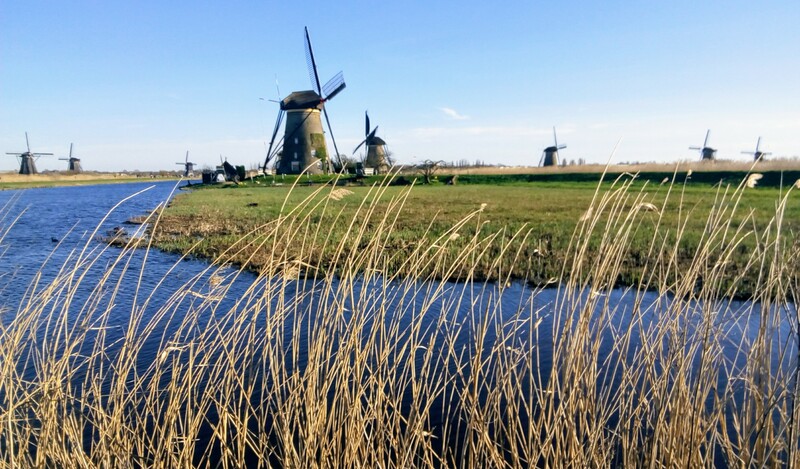 Windmills in The Netherlands – now that’s a destination for predictable instagrammers and other like-hunters in cyberspace. Only here it was (again) a question of company and humor. My friend N. -the first Couchsurfer I met- picked me up in Antwerp and drove me and her friend L. in her open convertible direction Rotterdam. And so we stopped at Kinderdijk for a true Dutch experience and some wine and snacks on a windswept bench with a view. Which was almost as windswept as the backseat of N’s convertible that sunny afternoon in March, where L. was compelled to produce a blanket to make the ride back to Rotterdam a tad more comfortable for her…and funny for all!